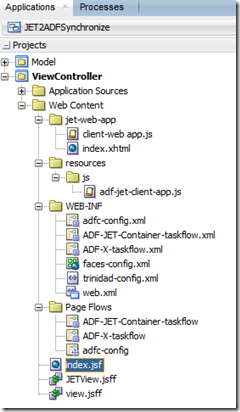 Even though ADF does not always play nice with guests, it is becoming increasingly common to have ADF applications – pure ADF or WebCenter Portal – that are the host to embedded user interfaces, created in technologies such as Oracle JET, Vue.js, Angular or React. This is not the ideal green field technology mix of course. However, if either WebCenter Portal (heavily steeped in ADF) or an existing enterprise ADF application are the starting point for new UI requirements, you are bound to end up with a combination of ADF and the latest and greatest technology used for building those requirements. 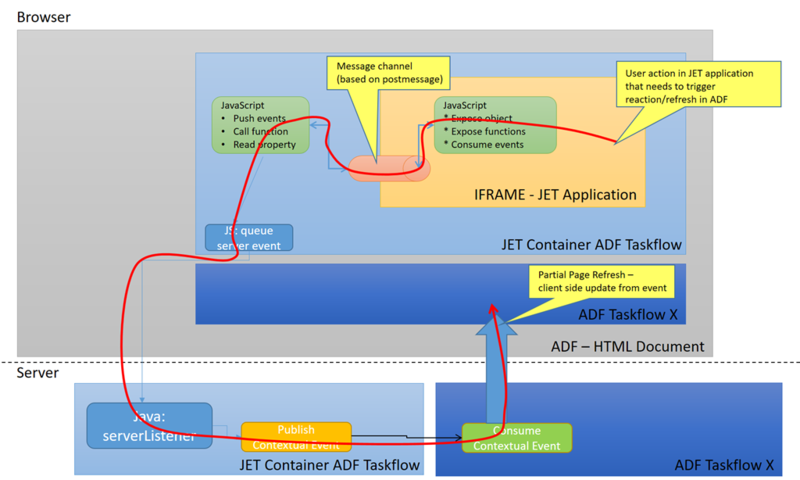 The UI components created in ADF and those built in other technologies are fairly well isolated from each other, through the use of the IFRAME. However, in certain instances, the isolation has to be pierced. When a user performs an action in one UI component, it is quite possible that is action should have an effect in another UI area in the same page. The other area may need to refresh (get latest data), synchronize (align with the selection), navigate, etc. We need a solid, decoupled way of taking an event in the embedded IFRAME area of the latest UI technology and bring it all the way to the other (regular) ADF taskflows in the page. Note: where it says JET, it could also say Angular, Vue or React – or even plain HTM5. 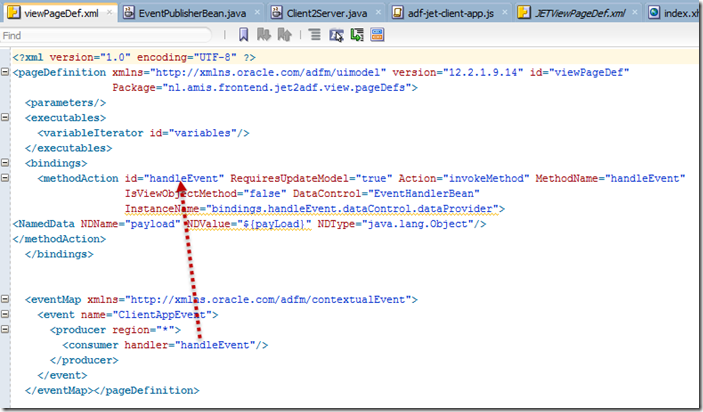 The publishEvent method binding is specified in the page definition for the current page. 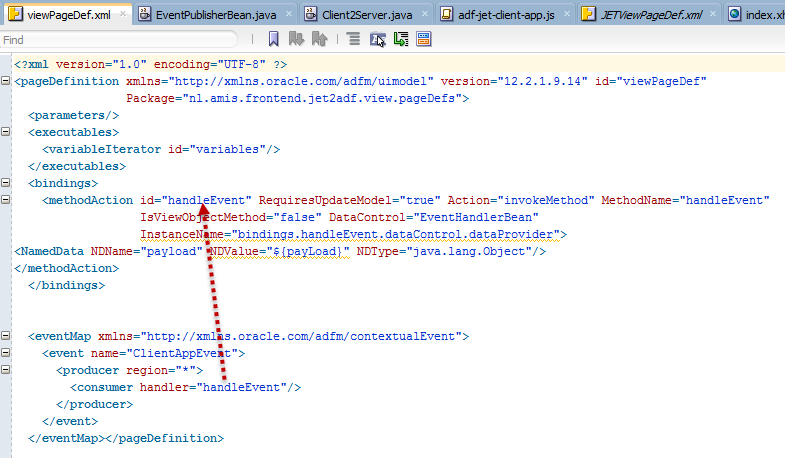 It invokes method publishEvent on the Data Control EventPublisherBean that was created for the POJO EventPublisherBean. The method binding in the page definition contains an events element that specifies that execution of this method binding will result in the publication of a contextual event called ClientAppEvent that takes the result from the method publishEvent as its payload. 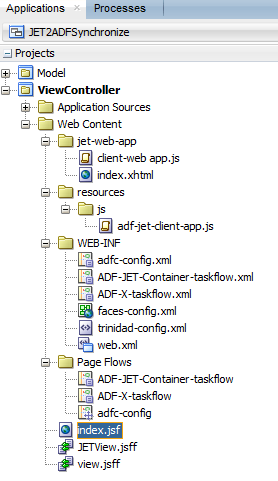 At this point, we leave the ADF JET Container Taskflow. It has done its duty by reporting the event that took place in the client. It is available at the heart of the ADF framework, ready to be processed by one or more consumers – that each have to take care of refreshing their own UI if so desired. 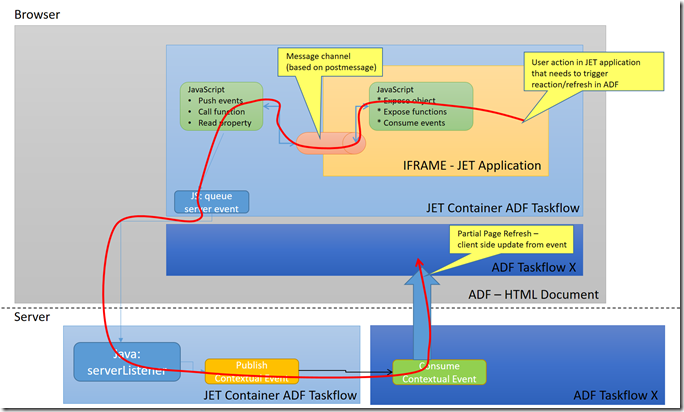 At this point, all effects that the action in the IFRAME should have in the ADF Application – both server side as well as client side – have been achieved. And now for some real code. "param1" : 42, "param2" : "train"
<af:panelStretchLayout id="psl1" styleClass="AFStretchWidth" bottomHeight="0px" topHeight="40px" endWidth="0px"
Java Class Client2Server – handles server side of server listener: processing incoming custom events from client, i.e. JETView.jsff. 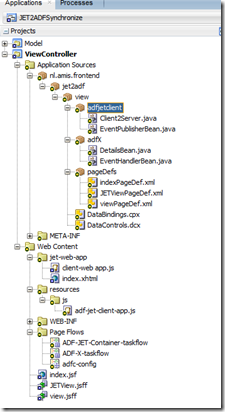 Create Data Control for this Java Class. 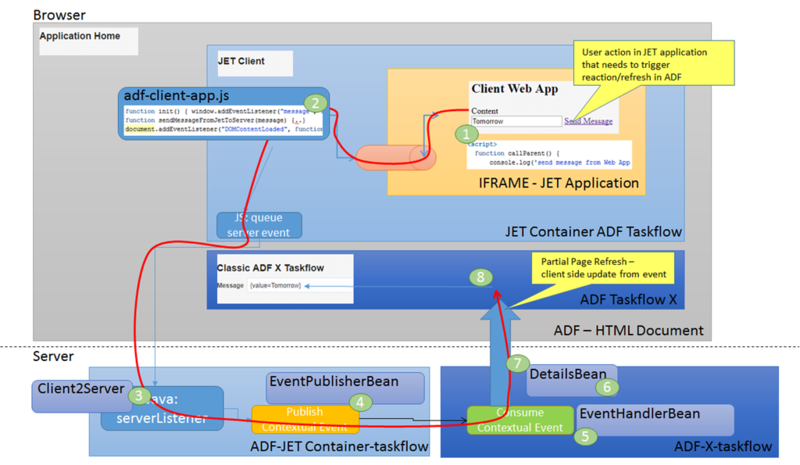 <methodAction id="publishEvent" RequiresUpdateModel="true" Action="invokeMethod" MethodName="publishEvent"
<methodAction id="handleEvent" RequiresUpdateModel="true" Action="invokeMethod" MethodName="handleEvent"
The consumer for the event references the handleEvent method action that is created for the handleEvent method in the EventHandlerBean POJO for which a data control is created. 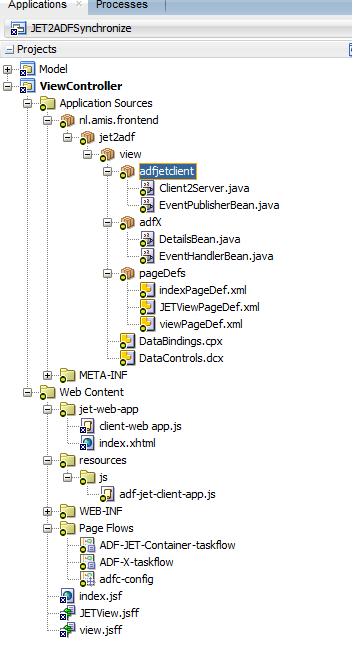 The view.jsff file defines the inputText element that is bound to the detailsBean and also takes its value from that bean. This component will be updated in client when the event consumption is completed. Sources for this article: https://github.com/lucasjellema/WebAppIframe2ADFSynchronize.